We've been working hard all week to put the finishing touches on 2 new classes and they are ready just in time for your three day weekend (hopefully you don't have to go to work on Monday)! Are you a seed bead fanatic in need of an inspiring project? 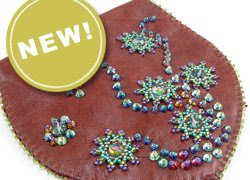 Check out Laura McCabe's new class, Bag It, exclusively designed for Beaducation. This embellished leather pouch is so beautiful that you'll want to make two; you'll have a hard time giving it away as a gift. Is wire what you're crazy about? 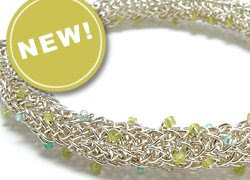 You'll want to take Iris Sandkühler's new Unsupported Viking Knit 1: Rope Bracelet class. This "knitted" bracelet is flexible and comfortable on the wrist. Iris's signature technique also allows for easy embellishment so you personalize your latest project with your favorite beads. I've been waiting patiently for the Laura McCabe class; I was very excited to see it had been added to the list!